Nokia, the dominant force in the handset industry, has spent the major part of 2009 guarding its turf against resurgent rivals like Samsung, LG, Sony Ericsson and Motorola, and also tech powerhouses like Research in Motion, Apple and HTC. Additionally, Nokia has also been deflecting blows at the operating system level, most notably from Google's Android and Microsoft's Windows Mobile. To be fair, Nokia has not exactly been a dormant observer all this while. Click NEXT to read further. . . Image: Nokia's new netbook computer, the Booklet 3G, is seen next to a Nokia handset at corporate headquarters in Helsinki. This year, the Finnish handset major intends to counter its competitors, contain the market share erosion in the higher-end smart phone market and keep a check on persistent average selling price pressure in the lower-end segment, with a fresh category of mini-laptops. 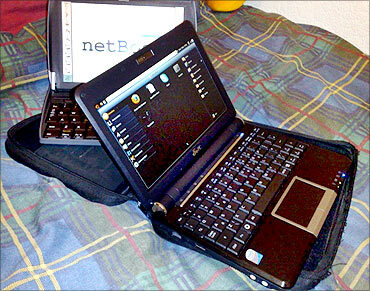 Nokia has decided to take its wireless capabilities to personal computers with the Nokia Booklet 3G. 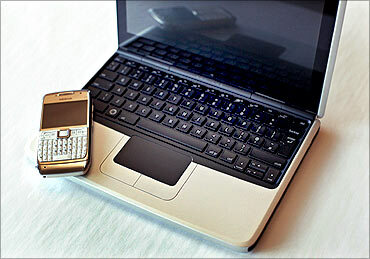 As Nokia announced its intentions to launch the Nokia 3G Netbook, the stock price rose 6 per cent on a single day. 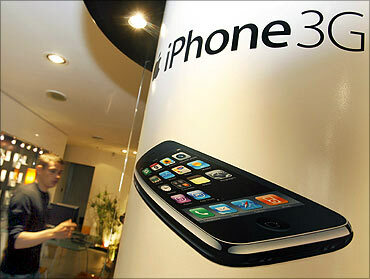 Image: An advertisement for the Apple iPhone is shown at a retail store. It would be reasonable to say that even though Nokia was caught out of sync by the launch and subsequent success of the Apple iPhone and the slew of new BlackBerry models from RIM, the company is set to show critics what it can do with Booklet 3G. Nokia is in the pole position as it becomes the first mobile phone manufacturer to launch a netbook, clearly marking a transformation in Nokia's roadmap for the future. Nokia's mobile phone share in the market keeps swinging between 35 and 40 per cent and overall smart phone share is somewhere static at around 40 per cent. According to analysts, this does not mean that the company is not growing, but it does indicate that the time was right to set up the focus on various other untouched areas, and Nokia Booklet has evolved from that. Image: Nokia's new netbook computer, the Booklet 3G. "PC users deserve more and the 3G Booklet gives them just that, by broadening the otherwise predictable PC market," Nokia India managing director and vice-president D Shivakumar had said in an earlier interview. While most netbooks (what small, light and inexpensive laptops are called) usually start at Rs 15,000, Nokia's offering will cost roughly $800 (Rs 40,000). The company says this is because the Booklet 3G is more like a 'mini-laptop' than a netbook, with its Atom 1.6GHz processor, 12-hour battery life, 10.1-inch HD display and Windows 7 operating system. 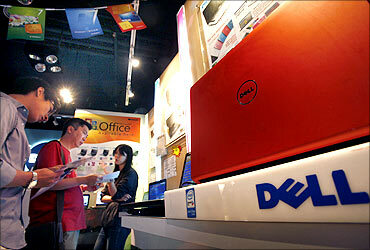 Image: Customers examine Dell laptop models at a Dell outlet in Hong Kong. Nokia has shown an increasing amount of interest in Linux, a competitor to the Windows operating system, and even announced that it will work with Intel on mobile devices that run the Linux-based Maemo platform. Even so, it did not choose Linux for its debut in personal computers. By choosing a Windows operating system, say market analysts, Nokia has ensured that its mini-notebook makes sense to consumers who have never really warmed to Linux netbooks. 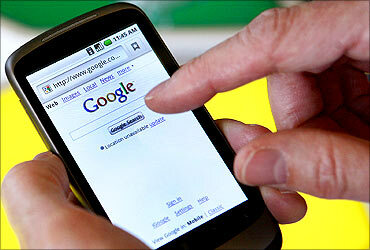 Image: A model demonstrates a Nexus One smartphone, the first mobile phone Google will sell directly. 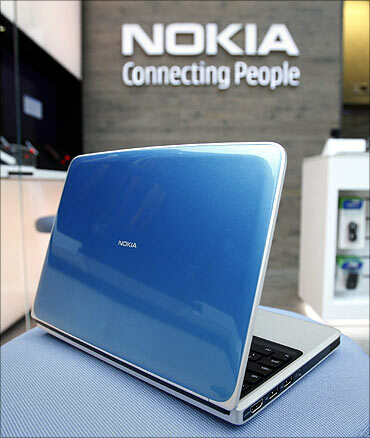 So will Nokia's 'mini-laptop' find a niche among consumers looking for powerful netbooks, regardless of price? Possibly, but not before Nokia battles another round of stiff competition from established computer manufacturers like Lenovo, Dell and Acer which are eager to increase their share of the market. And to succeed in an economy like India, Nokia has to also resolve the quagmire of pricing the Booklet 3G right. It can't be too cheap because that will make smart phones such as the Nokia N97 look expensive, and it can't be too expensive because that could alienate consumers who are aware of low-priced netbooks.